For the first time ever, astronomers have detected circularly polarized light emitted from a dying star collapsing into a black hole. Above is an artist’s impression of the collapsing event, which is known as a gamma-ray burst. The circularly polarized light gives astronomers a good deal of information about the event that they might not otherwise obtain. Light is a wave and the particular orientation of that wave (up-down or left-right) is its polarization. When light is circularly polarized, it is oriented in a spiral, sort of like a stretched-out slinky or a corkscrew. Circularly polarized light is relatively rare and astronomers did not think that gamma-ray bursts were likely to produce it. The team that observed this particular event thinks the polarized light was emitted by a matter shockwave that traveled outward from the gamma-ray burst after its initial explosion. Electrons within this material were accelerated to nearly the speed of light, producing the circularly polarized radiation. By studying the light, astronomers hope to learn more about the structure of the shockwave from the gamma-ray burst. We chose this illustration because it’s cool to look at, and we have a pretty big soft spot for artists’ renderings of space (both realistic and not). But, we should point out that some artistic license was taken with this one. 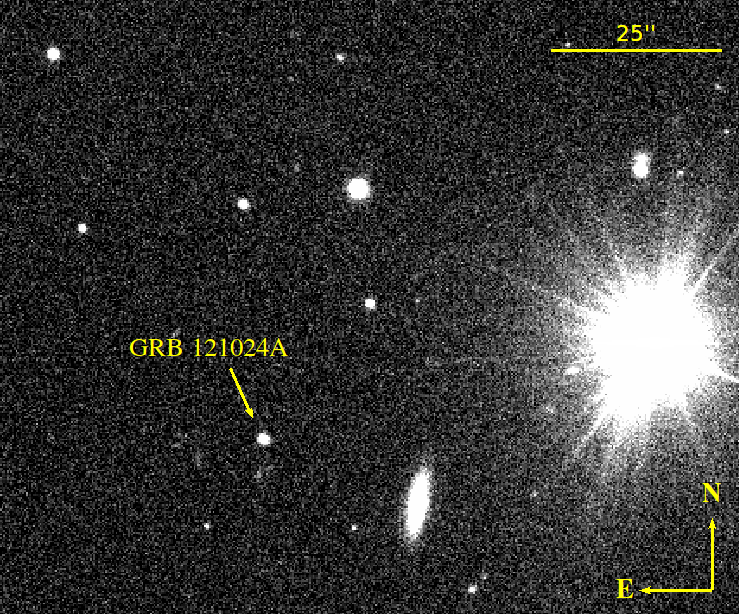 The gamma ray burst that astronomers detected using the Very Large Telescope in Chile happened 18.5 billion light years away. But the background of the illustration is a Hubble Telescope image of gas and dust in a cluster of stars known as NGC 602 (that reminds us a little of T-Rex), located in the Small Magellanic Cloud, a galaxy that is only 7,000 light-years away. The artist’s conception of the gamma-ray burst has been added to the photo. While it may not be precisely accurate, it’s way prettier than what the scientists actually saw.